I’m always a little sad when I eat my last juicy peach of the summer. My mood quickly cheers, however, when I think ahead to pumpkin! For a quick pumpkin fix, I enjoy stirring a quarter cup of pumpkin puree into a serving of basic stovetop oatmeal. For a muffin-like version of oatmeal that my whole family enjoys, I turn to this baked oatmeal recipe. I have long relied on homemade baked oatmeal as an easy, economical, and wholesome way to start the day. Store-bought versions can be delicious but often contain more sugar and oil than oats. Doing it yourself allows you to control the ingredients in a way that still tastes great. This version is sweet enough to satisfy our tastes and cleverly uses the natural sweetness of a freshly grated apple. There’s probably no food I have experimented with more than baked oatmeal, and I have created many variations of the original, which reminds me of eating a warm oatmeal cookie for breakfast. One thing is certain, the recipe is forgiving and can be adapted in a myriad of ways. So feel free to try it first as written, and then adjust to personal taste by adding some nuts, raisins, shredded coconut, or a little extra pumpkin. For those who need to keep added sugars to a minimum, the sugar in this recipe can be easily reduced by omitting the topping–although there is something quite special about that sweet crunch on top. As an option, you can forgo or reduce the maple syrup that’s mixed into the oatmeal and keep the crunchy topping. Because it’s right on top, a small amount goes a long way. In a large bowl, mix together all of the ingredients except the oats and brown sugar. Then add the oats and mix until thoroughly combined. Transfer the mixture to the baking dish or muffin tins. (See notes**) Cover with plastic wrap and refrigerate overnight or at least 2 hours. In the morning, set the uncooked oatmeal on counter while the oven preheats to 375 degrees F. Bake for 27-30 minutes (or about 20 minutes for a muffin pan), or until the oatmeal is just cooked through the center. Remove the pan from oven, sprinkle the brown sugar evenly over top of oatmeal and broil for one minute, watching very closely, or until the sugar melts and begins to caramelize. Serve warm with milk, fruit and/or nuts, if desired. Great leftover. Freezes well. *Pumpkin pie spice is a combination of cinnamon, ginger, nutmeg and allspice. If you do not have the pumpkin pie spice, use any combination of these that you like, or simply use cinnamon. **When baking as muffins, I refrigerate the uncooked oatmeal in the mixing bowl and transfer it to the muffin tin once the liquid has been absorbed by the oats. You can make 8 regular muffins or 6 jumbo. I am always experimenting with my recipes and here is my latest trick: For those who like a little extra “texture”, mix two tablespoons of steel cut oats into the batter and proceed as usual. A quarter to a half cup of chopped nuts and/or shredded coconut are other good options. Wow, that sounds good for breakfast. Thank you for the recipe. You are welcome, Sue! Hope you enjoy! Sounds wonderful, so anxious to try it. I hope you enjoy it as much as we do, Patricia! I made this today & it was great! I added some mascarpone (like in your peaches and cream baked oatmeal recipe) then sprinkled chopped walnuts along with the brown sugar on top. Very yummy. My husband had 2 servings! I am so happy it was a success, Christine, and I love your variation! Thank you very much for the feedback, Mim! I am thrilled they were a hit at church. How wonderful of you to make them for everyone! Such a great way to do oatmeal! Love it! Thanks, Amee! We love our oatmeal and this is an extra tasty way to eat it! sounds delicious – do you think you could completely replace the old fashioned oats with steel cut?? and do you have any info on the nutritional facts? The texture would be different with all steel cut oats. I have cooked with them a lot, and after much experimentation, found a way to make them in a similar fashion. I will share that recipe one of these days soon! I haven’t entered my recipes into a calorie/nutrition program, but several people have mentioned two–Caloriecount.about.com and MyFitnessPal. I hope that helps! AH! Found another one I am going to make, and I have my great-great grandmother’s cast iron skillet to use, it will be perfect! Those old cast iron skillets just can’t be beat! I hope you enjoy, Mary Lou! This looks great. I just made baked oatmeal for the first time and loved it … Not a fan of hot oatmeal. I am sure that I will love the pumpkin version. Also voted! Good luck. Thank you very much for the comment and the vote, Marlys! I hope you enjoy the baked oatmeal! I made this today, assembled it this morning and put in the fridge and baked it later this afternoon. Smelled heavenly, but I am saving it for breakfast tomorrow. Can’t wait to try it! Thanks! I’m out the door usually by 6:30 in morning so having something ready to grab and eat at work makes much easier. I also did better job of carmelizing the brown sugar on top this time. Just ate my piece I brought in and it is fabulous! Not too sweet, just right with the crunchy brown sugar glaze on top. So good Ann! I am so glad! I appreciate any help in the mornings as well! I’ve loved all of your baked oatmeal recipes and this one was no exception. I made two batches of it last week — one in a casserole dish and one in muffin form. I brought the muffins into work and they were a huge hit. 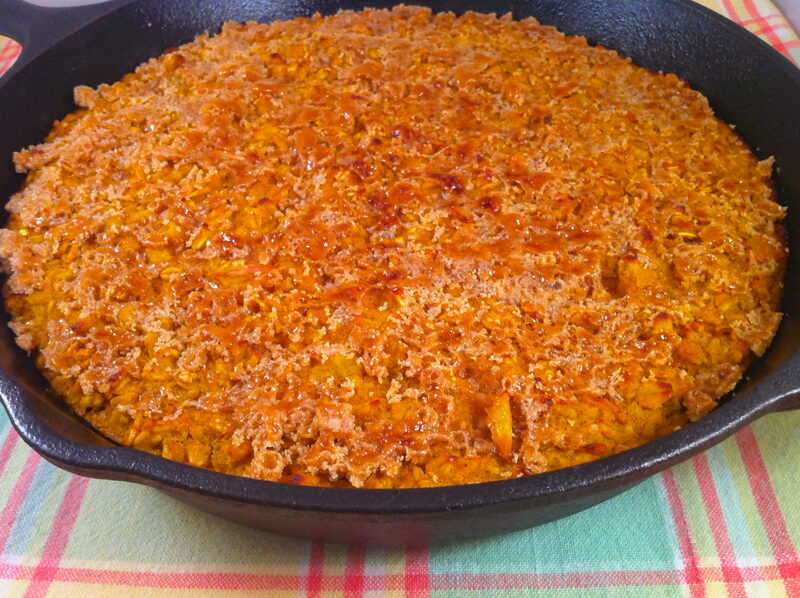 Several folks asked for the recipe and it was so easy to copy the link and send it to them. Folks seem to really appreciate healthy, flavorful, and easy to make recipes. Thanks for giving us lots of options, Ann! You are so kind to pass along the wonderful feedback, Rila! I am so glad you–and your coworkers–enjoyed this version and appreciate your passing along the link. That was so thoughtful of you to take a batch to work, by the way. Your coworkers are lucky to have you! 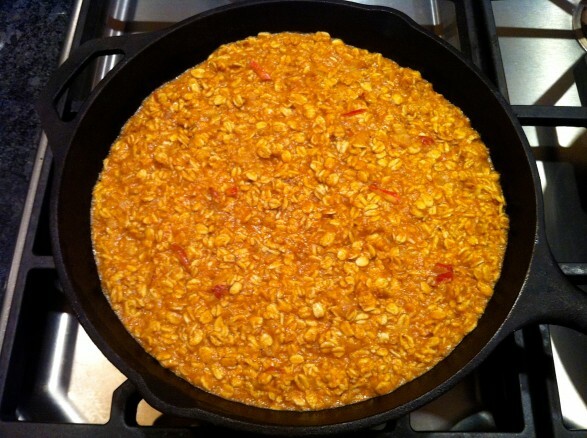 Pingback: The Fountain Avenue Kitchen – Prize-Winning Crunchy Top Apple Cinnamon Baked Oatmeal — and a trip giveaway! Just when I had given up on crock-pot oatmeal and blogged about what a fail it was. I just read this recipe that someone shared with me. This actually looks interesting and yummy. I would love to redeem the negative review I wrote about Oatmeal, this would help. If this is an original recipe, do I have your permission to blog about it? Thanks, Hippy in the Kitchen! Hi Terri and thank you for asking. You are more than welcome to blog about this recipe. I have used this technique for other recipes, too. It is great for avoiding overcooked oatmeal and a lot of mess…makes a delicious breakfast easy! I made this yesterday morning. It’s wonderful!!! My mother in law would make oatmeal one day and the left over would go in a bowl till next day then take it out slice it off and fry it in butter and pour homemade syrup over the top it was awesome and my kids loved it . That sounds wonderful, Nona. I think it would be a hit here, too!